Tag Archives — "walk-in closets"
You do not have to settle for a plain brown door or plain white door. 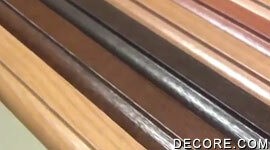 There are different types of wood that are utilized in the construction of closet doors and the trim surrounding them. This means that you have options based upon the style of the room in which the closet is to be installed and your individual taste. Custom walk-in closets aren't just a status symbol either. They are truly valuable for a number of reasons. A custom walk-in closet will reduce the eyesore that clutter and disorganization creates. In a poorly designed closet, shoes are thrown in a heap on the floor, clothing is piled on top of each other and a lot of usable space is sadly wasted.